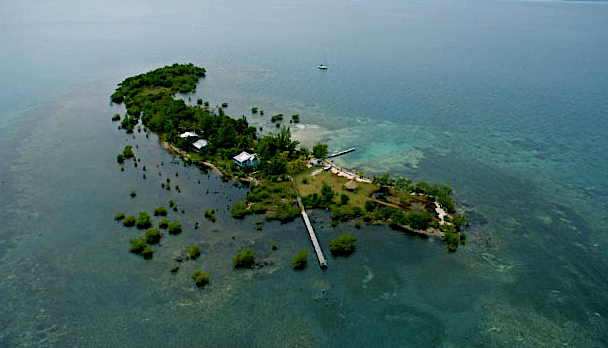 The Central American country of Belize is a well-known destination by both saltwater fly fishermen and divers. Its main attraction is its longest barrier reef in the western hemisphere, second in the world only to Australia's Great Barrier Reef. Its tropical waters are home to rich flora and fauna. Although there is good bonefish and tarpon fishing, Belize's star is the permit, one of the most difficult species to catch on the fly. The Central American country of Belize is a well-known destination by both saltwater fly fishermen and divers. Its main attraction is its longest barrier reef in the western hemisphere, second in the world only to Australia's Great Barrier Reef. Its tropical waters are home to rich flora and fauna. Although there is good bonefish and tarpon fishing, Belize's star is the permit, one of the most difficult species to catch on the fly. 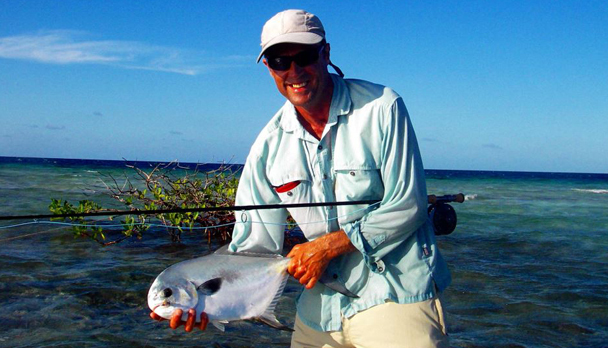 Permit are found all over Belize, but the proven best spot is in the waters off the coast of Placencia, inside the Barrier Reef. There, anglers give themselves the pleasure of catching permit tailing, alone or in schools, of considerable sizes on average. These waters offer impressive fishing of tarpon, bonefish, snook and jacks (mutton and horse-eye). Outside the coral reef, sailfish, Mahi-Mahi, wahoo, tuna (yellow fin and black fin) can also be found, depending on the time of year. To get to Belize from the USA, South America or Europe, direct flights are available from Miami, Dallas/Fort Worth, Houston, and Los Angeles. To get to Placencia, there are more than 11 flights leaving Belize International Airport daily (included in the cost of the package). All our fishing trips can be tailor made to suit each angler or group of anglers� needs, if so desired. However, we are offering a special program, including 7-nights accommodation lodging at Whipray Caye in the heart of the fishing area, with all meals included, and 6 fishing days. Located 8 miles from the coast of Placencia, the cabins at Whipray Caye are basic and clean. The resort consists of two cabins with two double rooms each, with ceiling fans, private bathrooms with showers. Meals are served by the owners themselves giving personalized attention. 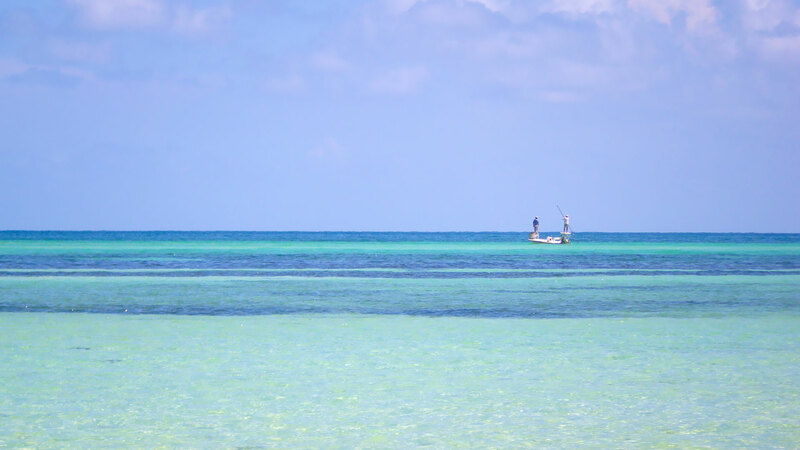 The fishing is minutes away from the resort, permit and bonefish can be caught from the edge of the caye, the fishing day is longer as you will start early in the morning, return for lunch, take a nap and go back out fishing again in the afternoon. There are no problems regarding security as there is no one else living in the area, the resort is located in the middle of the sea, the landscape and sunsets are amazing, and the food served is fresh and very good. 9-foot 9 or 10 weight rod. Floating line with sinking tip (WF). 10 to 12-foot leaders, 10-pounds minimum (we recommend fluorocarbon) and 16-pound test shock tippet (we recommend fluorocarbon). Flies tied on hooks #4 or #2. Crab patterns in natural, brown and green. Del�s Merkin, Del Browns Hermit, Brown Special, Rag Head, Mc Crab, Turneffe Crab, etc. Flies tied on hooks #8 or #6. Crazy Charlie, Gotcha, Clousers, Shrimp patterns and little crabs (olive and natural). Floating line (WF), Intermediate or Sinking Tip. 50 to 70-pound test shock tippet (We recommend fluorocarbon). Flies tied on hooks #1/0, #2/0 and #3/0. Black Death, Purple Death, Cockroach, Stu Apte, Gummy Minnow, etc. Rates include: Transfer Placencia/Whipray Caye/Placencia. 7 night accommodation and 6 full fishing days. All meals included. Complimentary use of snorkel gear and see-through kayak. Rates do not include: Air ticket to Belize and Placencia. Personal health insurance. Fishing equipment and flies. Gratuities. Notes: Alternative quotes can be made for different durations and for double basis. No report have been received yet.